Reverse symmetric starting positions have a unique feature, both White and Black players have the same view of the board, both of their own pieces, as well as for the enemy army. The left diagram shows the Chaturanga intial layout from White's point of view, while the one on the right shows it from the Black point of view. 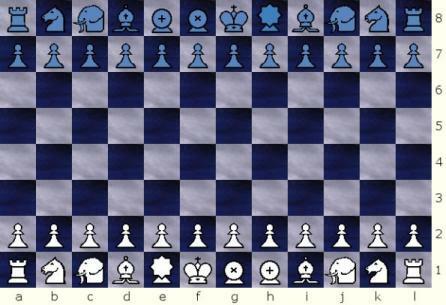 Notice that from both White's point of view the Rooks, Knights and Elephants are symmetrical accross the board. The King and the Counselor are in the middle two squares of the first rank, with the Counselor always to the left of his King. The same statements are all true from Black's point of view as well. This is reverse symmetry! 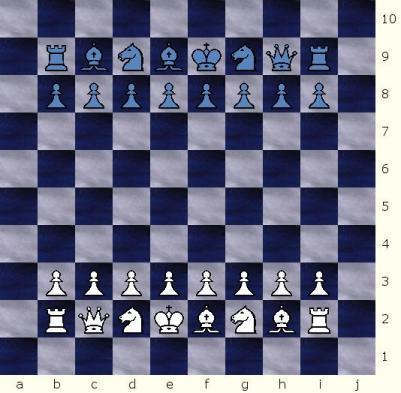 Here the King and Queen are in the middle two squares of the first rank, with the King to the left of the Queen from both players perspectives. 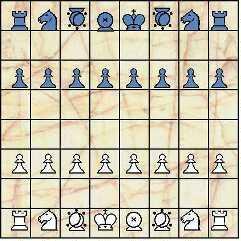 Look at the Bishop and the Rook in the second row, with the Bishop to the left of the Rook from both players perspectives. Look at the middle 4 squares on each players' first rank. 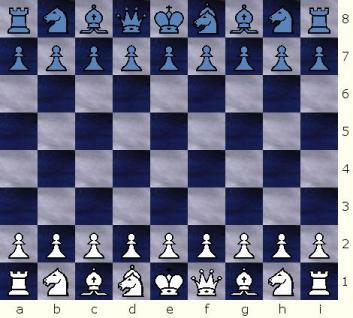 On these squares, from both White and Black's perspectives they see the General (Queen+Knight) to their left, followed by the King, the Queen and finally the Adjutant (Bishop+Knight) rightmost. Reverse symmetry! Abbott initially called the game Baroque, but later included it in his 1963 book "Abbott's New Card Games" under the title of 'Ultima'. 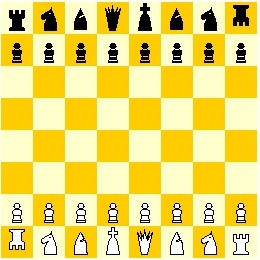 This time from both White's and Black's point of view, the Rooks, Knight's and Bishops are placed symmetrically accross the board, the King, Queen and Prime Minister (Bishop+Knight) are in the middle three squares of the first rank, with the King in the middle, the Queen to his right and the Minister to his left. 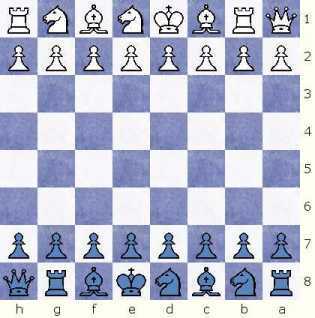 Here in the starting position the Queen is to the left of the King, and the Sissa to the right of the King, from both players perspective. What was probably not done before was to apply the reverse symmetric concept to random chess variants. 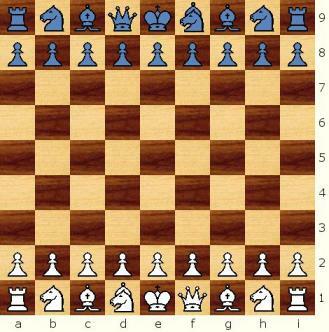 Modern Random Chess (MRC), Contemporary Random Chess (CRC), Prime Ministers Contemporary Random Chess (PM-CRC), Modern Capablanca Random Chess (MCRC), International Contemporary Random Chess (ICRC) and Modern English Random Chess (MERC) are all new variants that use reverse symmetric layouts. In a 9x9 board reverse symmetrical setup the piece at the square a1 for White, is the same as the piece at i9 for Black. 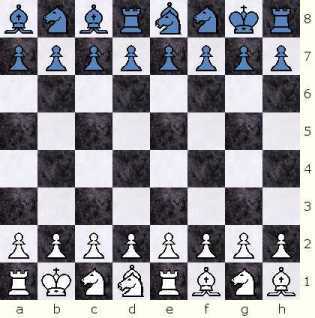 The piece at b1 for White is the same as the one at h9 for Black, and so on. 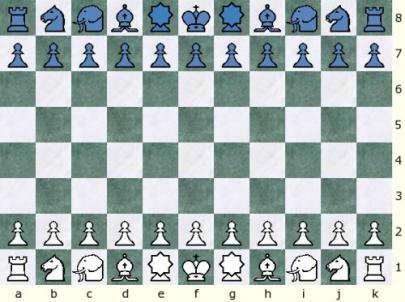 The Pawns are in the second row of each playerâ€™s side. 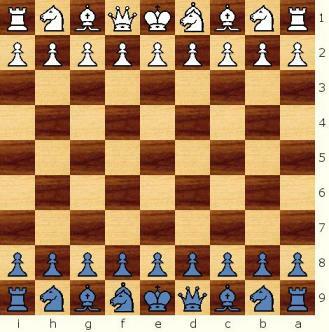 In the Modern Random Chess position on the left, from Whiteâ€™s point of view, the Bishops are both on his leftmost dark squares, his Queen is to the right of the King, his Prime Minister is on his right corner, and so on. Also, from Whiteâ€™s point of view, his opponentâ€™s Minister is on the opposite corner across the diagonal as his own, the opponents Queen is across the board from the Rook to the left of his King, and you could continue to describe the position of the opponentâ€™s pieces in relation of Whiteâ€™s own. Now look at the same MRC position in the diagram on the right, but from Blackâ€™s point of view. Every single observation made from Whiteâ€™s point of view above, applies as well to the point of view from Black. Reverse symmetry! In a standard 8x8 board reverse symmetrical setup the piece at the square a1 for White, is the same as the piece at h8 for Black. 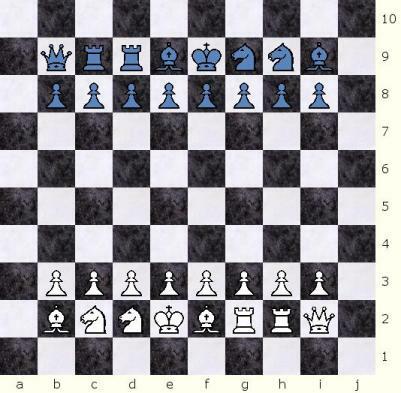 The piece at b1 for White is the same as the one at g8 for Black, and so on. 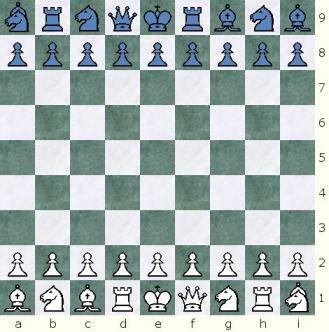 The Pawns are in the second row of each playerâ€™s side. 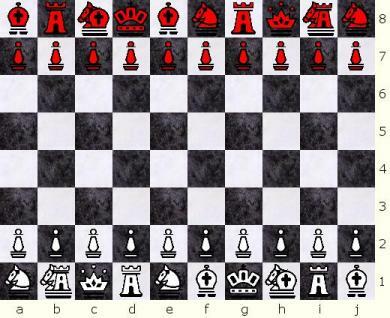 In the CRC position on the left, from Whiteâ€™s point of view, the Queen is on the leftmost square next to a Rook, his 2nd Rook is on his rightmost square next to a Knight, the Bishops are on their traditional Orthodox Chess initial squares, the King has a Knight to his right, and so on. 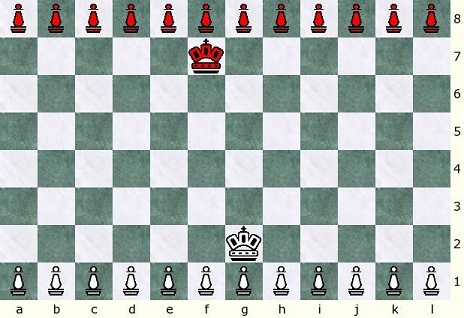 Also, from Whiteâ€™s point of view, his opponentâ€™s opponents King is across the board from the Knight to his right, the Bishops are across the board to each other, the Queen is on the other corner of the same long diagonal as his own Queen, and you could continue to describe the position of the opponentâ€™s pieces in relation of Whiteâ€™s own. Now look at the same CRC position in the diagram on the right, but from Blackâ€™s point of view. Every single observation made from Whiteâ€™s point of view above, applies as well to the point of view from Black. More sample random setups with reverse symmetry: 'Prime Ministers Contemporary Random Chess' (8x8) and 'Modern Capablanca Random Chess' (10x8). I didn't invent the concept of reverse symmetry. Like I said before, it's been known for centuries. What I did do was to identify the concept of reverse symmetry and apply it to random chess variants. I'm a fervent player of Fischer Random Chess. When I discovered Maura's Modern Chess early in 2008, I decided to adapt to the game some FRC concepts, and after identifying reverse symmetry, Modern Random Chess was born. My next reverse symmetric "accidental" discovery was Contemporary Random Chess, which I found after setting up the new Bishop Ajustment Rule. Modern Capablanca Random Chess is my random adaptation of the four 'Modern' chess principles to the great JosÃ© RaÃºl Capablanca's 10x8 game. Prime Ministers Chess (9x8), Prime Ministers Contemporary Random Chess (8x8), International Contemporary Random Chess (10x10) and Modern English Random Chess (10x10) are my last variants to join the reverse symmetric group.